Let’s face it. Losing your hair in your early 30s—for whatever reason—is a scary experience. When mine started falling out in large quantities about two months ago, the coincidental timing with my return to the low-protein PKU diet did not go unnoticed. And while I’d rather deal with this humbling experience in private, I felt this subject warranted some attention especially since I’ve only been able to find bits and pieces of anecdotal evidence of the connection between PKU and hair loss. Protein deficiencies—As was cited in this 2007 article from National PKU News, if a PKU patient is found to be protein deficient, simply increasing the amount of formula consumed each day could help. Speak with your PKU clinic and ask them to run an albumin blood test to determine if you are protein deficient. Vitamin, micro-nutrient and fatty acid deficiencies—Because the PKU diet is so restrictive, vitamin, micro-nutrient and fatty acid deficiencies are likely culprits. A 2010 article from Karger Publishers titled Nutritional Management of Phenylketonuria notes that “Some AA [amino acid] products are devoid of vitamin and mineral supplements to improve taste and acceptability with the assumption that separate vitamin and mineral supplements will be taken each day,” (p. 62). The article goes on to note that the PKU diet tends to contain more carbohydrates and less fatty acids. To help counteract these deficiencies, you may want to take a daily multivitamin and make an effort to consume more vegetable oils that are rich in linolenic acid such as canola or soybean oil. Autoimmune disease, thyroid, poor blood flow and fluctuating hormones–These conditions may indicate that something is wrong independent from the PKU diet; however, it is not impossible for PKU patients returning to the diet to also experience one or more of these. For example, maternal PKU patients may experience “wonky” hormones during and after pregnancy. In any case, these conditions may require a specialist consultation outside of your PKU clinic. According to a registered dietician my clinic consulted with, hair loss from the sudden shock of returning to diet (which in my case was “cold turkey”), causes a large percentage of the hair follicles to enter into a resting or dormant phase. The patient doesn’t experience hair loss at that moment, but rather when the hair goes from the sleeping stage back into the growing phase, the new hair comes up and pushes old hair out. So in effect, the hair loss I am seeing now actually happened months ago, presumably when I returned to diet in January of this year. This theory about the stress a body endures after returning to the PKU diet is simply that…a theory. There is little to no research confirming this theory however plausible it may seem. PKU medical professionals may chose to ignore the matter altogether on the premise that they are there to treat the diet and nothing else. This narrow approach to PKU medical treatment is concerning though, especially when you consider that hair loss may become one of the most difficult barriers to dietary adherence. At least it has been for me. In the interim, until more is known about how to treat or avoid PKU-related hair loss, this scenario may also be another “case-in-point” for the need to supplement PKU dietary care with mental health support. 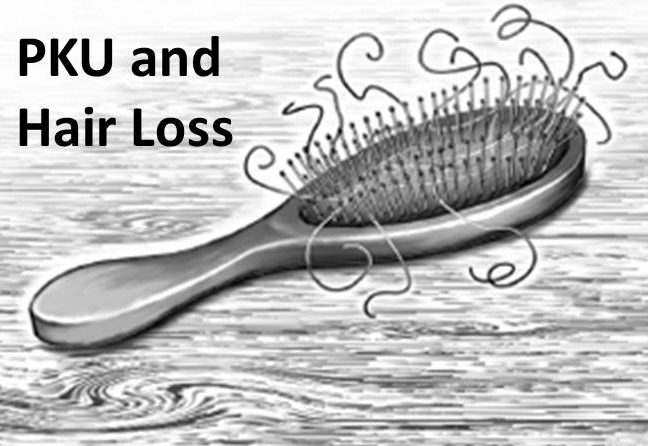 Be sure to check out the follow-up post on PKU-related hair loss: Hair loss experienced by PKU patients returning to the low-protein diet is temporary. I think you’re right. I have heard that typically people with PKU have light hair, fair skin and blue eyes…all of which can be attributed to pigment. When I was a child on diet, my mother said that she could always tell when I had been good at following my diet and when I wasn’t because of the bands of color in my hair (it would lighten when I wasn’t that strict and get darker when I was following it closely). You noted that you went back on-diet in September of last year…are you still experiencing hair loss this long after returning? Yes I am. My levels have been checked and everything is fine. I think as it was a long time off diet it will take a while for my body,to ( for lack of a better term) repair what it can. But finally got my level under 10 so I am happy about that. Doing a slow return to diet as not to become overwhelmed . Feeling good and not dwelling on the hair loss as I also see new hair coming in and yay,with color. Great article Nicole. I did some of my own research and studies show that supplementing the PKU diet with fish oil helps to decrease behavioral symptoms. Additionally, adding in fish oil will get you the fatty acids you need and maybe help your hair growth. I have not noticed a difference (with mood) since adding in fish oil, but continue to take it because we do get less in our diet. Let me know what you think! Have you every thought about adding in the large, neutral amino acids? I am going to start those soon and am excited to see how they work for me. You should ask your dietitian about those. Glad you found the post helpful and thank you for commenting about fish oil. I will have to try adding fish oil into my routine too. How would you go about adding large, neutral amino acids? Is that a pill supplement? It is cool because it can be taken as pills (a lot though) and it will cut down on the amount of formula you have to drink. I think they are also called phe block. Have you heard of it? Oh yes, I have heard of phe block. I don’t think that it is approved for maternal PKU though. Probably because the high-phe is still present in the blood stream. Vancouver adult clinic is starting a study about the fish oils to find out if they really do help,I will let you know when I hear anything. Please do, Tamara! Look forward to hearing how that study goes. Hi nicole, thank you so much for your post. It has helped me alot! As for i returned to diet as of january myself and have been loosing clumps of hair! Im at the 6 month mark now so im hoping to see a difference soon. My dietitian did confirm this has to do with nutrition which makes perfect sense! But its nice to see it confirmed in writing why its happening. I did put my body into shock or stress if you want to call it that because i went from eating whatever and the next day going back full force on diet so it does make perfect sense! It was so depressing as a hairstylist especially knowing and watching your hair falling put in clumps! I cried so much before i got this confirmed i didnt know what to do but deal with it so thats what im doing now is just dealing with it. I even asked my dietitian if i should be taking pre natal vitamins or biotin because i retirned to diet not only for myself but to have a baby. She told me biotin doesnt hurt but in my situation it wont help so i already take kuvan and i hate taking pills as it is so i wont bother taking them anyway. Before i started on diet i was at a 9 in just a few weeks on diet i went down to a 3.7 so my dietitian said from my levels dropping they way they are is another reason why my hair is falling out. Do you think that is true as well? I do believe that. Thats all part of the “shock” or “stress” they are talking about i feel. Which does make sense as well. My dietitian also told me that she wants my legel to get up to a 3 right now and once it remains at that for a while my hair loss will also get better. She said when our levels are too low that can cause hair loss because we arent eating enough Phe. Everything she has told me makes so much sense. It is amazing how much you learn through the years of having pku. I never knew this can happen to us but it makes so much sense! Thank you again for posting this it really does help us all out alot! Lisa – I am so glad that you decided to post a comment here and share your experience. I can certainly relate to the tears because on more than one occasion, I have cried through my entire shower. That always seemed to be when I would see the most hair loss and it even got to the point where I dreaded getting ready in the morning. Having more of an understanding about why this is happening has helped me to cope with the matter. I’ve also realized that the hair loss experienced after returning to the diet is temporary. Check out the follow-up post if you haven’t already: https://pkuparlor.com/2013/06/26/hair-loss-experienced-by-pku-patients-returning-to-the-low-protein-diet-is-temporary/. On a different note, I’m happy to hear that you are also back on diet for a potential pregnancy. We should definitely keep in touch as we both continue down this path. Please feel free to message me on Facebook: https://www.facebook.com/nicole.merrifield.16. P.S. If you haven’t started taking a prenatal vitamin as of yet, you should go ahead and start. Prenatal vitamins are known for helping hair and nails to grow…plus it includes folic acid which is recommended for all women planning a pregnancy. I can u derstand not wanting to get ready in the morning as well….i didnt want to wash my hair or brush it because i knew that more would come out. I have gotten alot better now though. So with time it will get better i do know that. I have to see my doctor and dietitian the end of july so i will ask them when i see them if i should start taking pre natal vitamins. I did ask them when i saw my hair falling out i asked about them and biotin she said pre natal i didnt need just yet and biotin she said it wouldnt hurt to take them but in my case wouldnt stop the falling out situation.